Life is like a box of chocolates. You never know what you’re gonna get. Sometimes, you end up with a small yellowtail – perfect for this week’s Grilled Whole Yellowtail recipe. Prep the yellowtail by sprinkling a liberal amount of kosher salt inside the gut and head cavity. Using a butter knife, and the salt as an abrasive agent, scrape out the blood line that runs underneath the spinal column. Also clean out any blood patches and small organs still attached in the gut and head cavity. Use paper towel to help you clean. Once the gut and head cavity are cleaned and dry, season them with salt and pepper. Brush both the gut and head interiors with cold press olive oil and finally stuff the gut cavity with all the herbs plus the two lime halves. Use three to four tooth picks to “sew” together the gut cavity This will prevent the herb stuffing from leaking out. Completely pat dry the outside of the fish with paper towels. Cut 3 slits on each side of the fish (for even cooking). Add pepper to the entire fish (no salt! ), and brush on a liberal amount of olive oil. Keep refrigerated until needed. Make the baste by adding the orange and lime juice into a small mixing bowl. Add a tablespoon of salt and pepper. Note the total amount of citrus liquid. Now slowly add half that amount of olive oil while mixing vigorously. Set the baste aside. Preheat your grill to its maximum temperature. Clean the grill throughly with a steel brush and then wipe it clean with vegetable oil soaked paper towels. Lay the yellowtail on the grill and cook for approximately ten minutes. Before flipping the fish, brush on more olive oil onto its exposed side. Then fill the fish. Begin brushing on the basting juice intermittently for the next 10 minutes. While basting keep checking for doneness by looking inside the cut slits. This will give you a chance to see inside the thickest part of the fish. 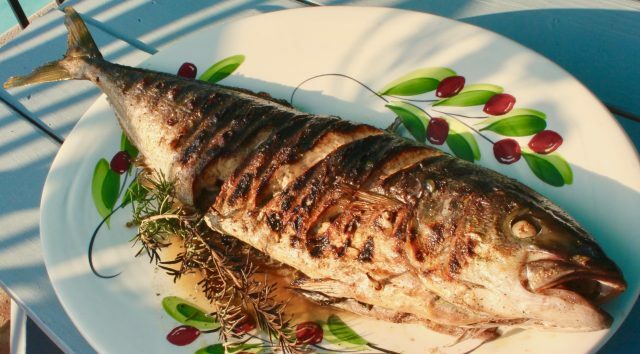 When cooked, place the grilled whole yellowtail in a large platter and pour the remaining basting juices on top of the fish. See more recipes from Fisherman’s Belly on BD.